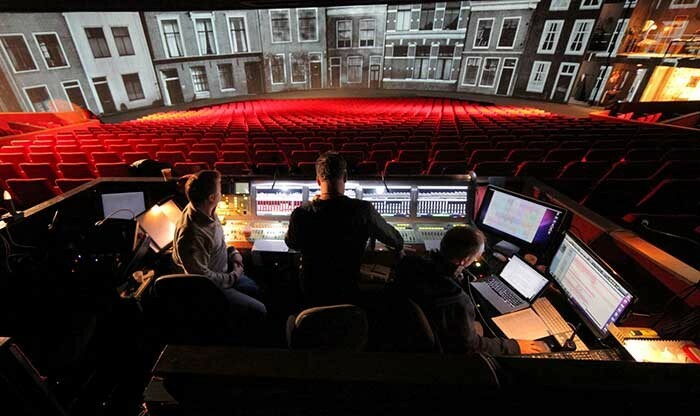 In October 2010, an Alcons LR14 loudspeaker system took its bow at the first performances of Soldaat van Oranje, De Musical (“Soldier of Orange, the Musical”), a huge, technically complex theatrical production based on the book by Erik Hazelhoff Roelfzema and the film of the same name. Three years, a thousand performances and over a million audience members later, the Alcons system is still performing flawlessly. Soldaat van Oranje, De Musica) is by far the biggest theatrical production ever staged in the Netherlands, housed in a converted aircraft hangar at a former military aerodrome in Valkenburg, near the city of Leiden. It tells the story of a group of Dutch students in the Second World War, each of whom follows a different path during the conflict, either as a collaborator or as part of the resistance under Nazi occupation. 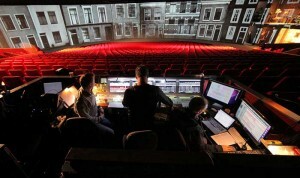 The show’s production is unique, with the raked audience seating on a 30m/100ft. diameter turntable in the middle of the hangar. The perimeter is divided up into different stage sets, the 1100-strong audience and 180º video projection revolving from scene-to-scene. The actors walk between the sets, maintaining continuity as the audience turns. Sound designer Jeroen ten Brinke chose nearly 100 Alcons LR14 pro-ribbon line-array cabinets for a huge surround system - fed via an optical cable, fitted on a drum system that turns through a total of 7,000º to avoid breakage - every one of which is still working perfectly today. Each scene features an L-C-R array of LR14s, plus a 15” sub, driven by 30 ALC4 2x 2kW amplified loudspeaker controllers. With 14 arrays in all, as the seating revolves the right-hand array from the previous scene becomes the left array of the next one. The quality of the Alcons pro-ribbon LR14s was crucial in making these transitions smooth and lifelike. However, just as important was the exceptional reliability of the Alcons equipment. After a thousand shows, one would expect even the most rugged loudspeaker or amplifier to be tiring, but the Alcons units are showing no sign of it. “The LR14s and ALC4s have been worked relentlessly hard, but there has not been one breakdown, not a single replacement needed,” says Alcons Audio co-founder Tom Back. “Not even any components have needed changing. Due to run until at least August 2014, currently plans are being developed for exporting this unique production to the UK, the USA, Japan and the Middle East.